Blog Last Chance for Buying a Northern Virginia Foreclosure? Posted by Jay Seville on Wednesday, June 4th, 2008 at 2:42pm. I’ve had a lot of people in interested in foreclosures the past 6 months. Often people ask me about them when looking for Clarendon real estate and I have to tell them sorry, but they are few and far between on the orange line. When you compare Arlington to other counties in terms of the # of foreclosures as a percentage of the inventory it’s amazing how Arlington VA in practically foreclosure free in comparison. In the past 18 months real estate in Washington DC metro and Northern Virginia went from 87th out of top 100 metropolitan markets up to #22. So the area ended up with nearly 16,000 foreclosures listings. Like everything though Virginia real estate is local–very local. The #s vary widely with some areas impacted very modestly while others were hit hard. These and fake short sale listings have had a significant impact on prices in those areas. 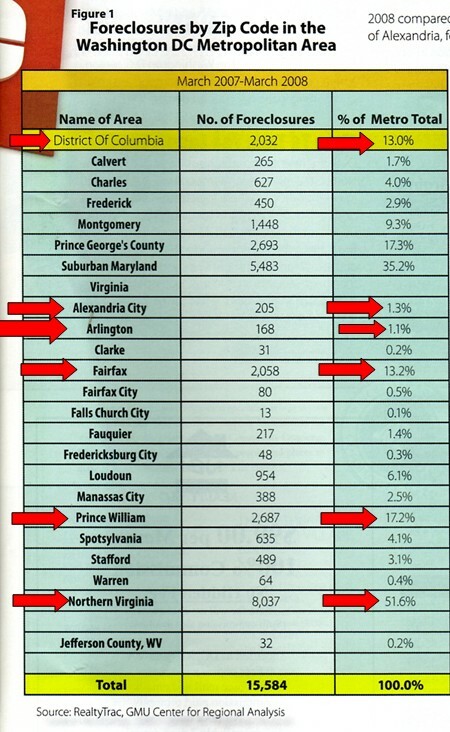 From March 2007 to March 2008 there were 21 zip codes in Northern Virginia with over 100 foreclosures–none of them were in Arlington or Alexandria City. An example of how foreclosures correlated with downward pricing pressure is found in Arlington Virginia. Prices were up 0.6% for Arlington Virginia in that March-March time period. But within 22204 which led the county in foreclosures by far with 83, the prices fell 7%. Yes Arlington real estate is hyperlocal. Generalizing entire counties doesn’t work if you are buying a home; you need to get to the local story–not the county wide or state wide story on the real estate market. The number of foreclosures is dropping significantly throughout Northern Virginia. In some of the hardest hit areas of Woodbridge in Prince William County, Centreville, Sterling, Station Square the numbers have decreased nearly 30% compared to a year ago. Are there still lots of foreclosures out there? Yes. Are their numbers coming down? Yes. Since the peak of the subprime loans was late 2006 the end of the 24 month resets on them will continue through late 2008 so they will continue coming on market. Could the worst be over now or this year as far as foreclosures? Likely. I highly recommend buying a foreclosure versus a short sale when it meets your needs. Most short sales are fake listings and a waste of your time. Occasional exceptions exist. Also keep in mind when you buy foreclosure you get what you get–AS-IS. So do not expect any repairs regardless of what you find wrong with the home on the front end. An inspection is done for information purposes.